A great update from the space weather experts on ESA’s Space Situational Awareness (SSA) team, who are reporting solar activity updates for Rosetta. 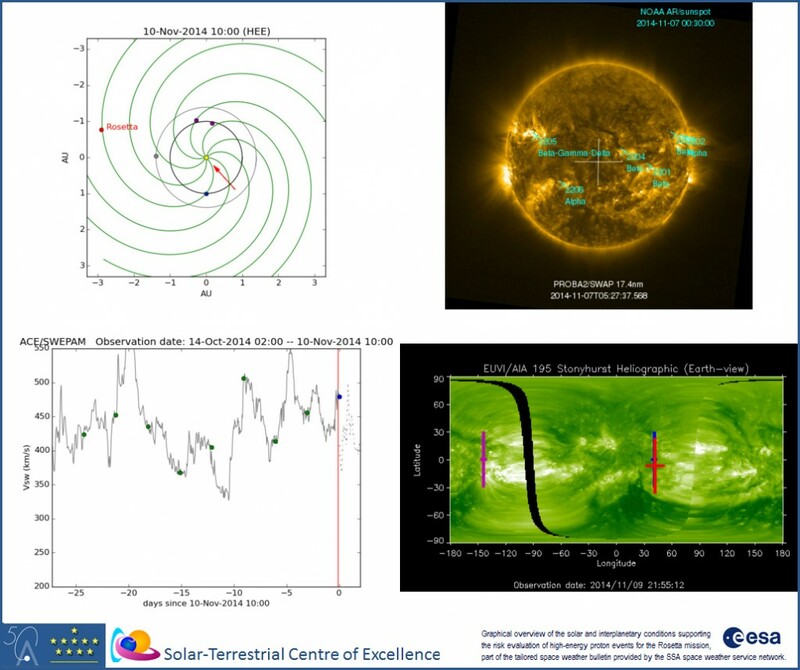 The text below was provided by Michel Kruglanski, manager of ESA’s Space Weather Coordination Centre located at the Solar-Terrestrial Centre of Excellence (STCE), Brussels, Belgium. The report below was extracted from the 7th bulletin issued on Monday, 10 Nov at 14:00 UTC. The next bulletin will be issued today around the same time. These bulletins are specially tailored to provide information about space weather conditions at Rosetta’s location. The type of space weather effects of interest to operational mission teams include solar energetic particles which can lead to errors in on-board memories and causing background radiation noise in the star trackers. The bulletins are consolidated by the SSA Space Weather Coordination Centre (SSCC) in Brussels from products of the SSA space weather service network and from reviews by scientists of both the Royal Observatory of Belgium and the Belgian Institute for Space Aeronomy. These two organisations are ‘network expert service centres’ (ESCs) for Solar Weather and Space Radiation, respectively, within ESA’s SSA programme. By monitoring solar activity and interplanetary conditions, the ESCs are evaluating the risk of solar proton events impacting the Rosetta mission. Such events are triggered by either a solar flare or by the interplanetary shock wave associated with a Coronal Mass Ejection (CME), accelerating protons to very high energies. Currently the attention is focussed on the solar active region 2205, which is having a complex magnetic configuration and is transiting the western hemisphere. Although the activity of this region is currently low, it is located in a region magnetically connected with both Earth and Rosetta location: flares occurring in region 2205 could cause solar proton event impacting the Rosetta mission. NOAA active region 2205 produced an X1.6 flare (peaking at November 7 17:26 UTC) and an M2.3 flare (peaking at November 9 15:32 UTC) in addition to multiple C flares. The X flare was accompanied by a CME which is mainly directed to a longitude in between Earth and Rosetta location (but closer to Earth). An Earth directed component arrived at Earth November 10, 1:30 UTC. Possible impact at Rosetta location is considered weak as well as unlikely. With NOAA region 2205 now turning onto the western hemisphere it approaches the Rosetta’s magnetic footpoint location and chances for a proton event are increasing. At present, the magnetic footpoints of Earth and Rosetta are close to each other. No increase in proton count was observed in the SREM instruments near Earth and on Rosetta during the past 72 hours. – Nov 07 18:46 UTC: Concerning the X1.6 flare. Flaring visible from Rosetta location but remote from Rosetta’s magnetic footpoint location. Hence no increase in proton levels is expected to be associated. – Nov 08 09:35 UTC: Concerning the CME associated to the X flare. At most the flanks of the CME could possibly arrive to Rosetta location but possible effects will be small as due to the moderate recorded speeds they will have mostly faded in the background solar wind. – Nov 08 09:57 UTC: Concerning weak CME events following the consecutive M2 flares of November 7. No influence on Rosetta is expected. The attached figure is made of four panels. Top left panel shows the parker spiral and the relative location of Rosetta (red), Earth (blue), STEREO A/B (purple) and Mars (gray). Bottom left panel shows the solar wind velocity at 1 AU used when deriving the parker spiral. Each circle corresponds to a spiral leg in the upper panel. The vertical red line corresponds to a leg passing through Rosetta location. Top right panel shows a former PROBA2/SWAP image of the solar disk centered on the region magnetically connected to Rosetta. The corresponding viewpoint is indicated by a red arrow on the first panel. Bottom right panel shows a composite heliographic map of the corona based on SDO/AIA and STEREO/EUVI data. The crosses mark the regions respectively connected to Earth (blue), Rosetta (red) and STEREO A (purple). 2205: Very active and approaching Rosetta’s magnetic footpoint location, hence increasing the chances for a proton event considerably.